t’s time for my annual attempt to pass on some common sense on leaf management. Enjoy the Fall color of course but plan the handling of the leaves and help spread the word to your friends and neighbors. Having the leaves hauled off to the landfill is the worst decision. It increases taxes, wastes time and money, throws away valuable soil-building organic material and looks terrible. Here's a better way. 1. 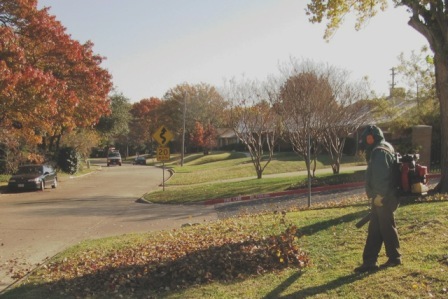 Leaves should never be blown, raked, put in bags and sent to the landfill. 2. Leaves should never be blown, raked, put into piles and set on fire. 3. Leaves should never be blown, raked and put into the compost pile - except as a last resort. 4. Leaves should never be blown on to the neighbor’s property or into the storm sewers or streets. 1. The best leaf management is to mow and mulch them into the turf. Using a mulching mower is best but not essential. Turf can take a large volume of leaves before there is excess. Excess leaves would be when the lawn is about to be completely covered and smothered by the ground-up leaves. 2. 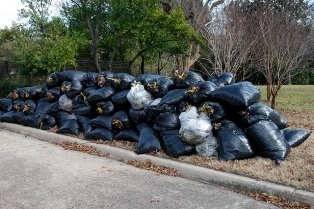 At the point of excess, the leaves should still be mulched on the lawn or driveway, and then raked, picked up and distributed as mulch in flower beds and vegetables gardens. 3. When no more mulch is needed in the flower and vegetable beds, the remaining leaves that have been ground-up by the lawnmower can be put into the compost pile. Add dry molasses to the beds and the compost pile to help the material break down and become humus more efficiently. Use it at about 20 lbs. per 1000 sq ft.
4. Never under any circumstances should the leaves be removed from the site. They should either be mulched or composted. All cities should outlaw the city service of picking up leaves and grass clippings. If home and business owners have to recycle the organic matter on their property, then the landscapes are healthier, water runoff is reduced, and less tax money has to be allocated to picking up and managing leaves and other organic matter. Everybody wins! Bagging leaves and grass clippings should be banned and illegal in every city. If you have any questions on this newsletter or any other topic, tune in Sunday 8 am -11 am central time to the Dirt Doctor Radio Show. Listen on the internet or find a station in your area. The phone number for the show is 1-866-444-3478. Please share this newsletter with everyone in your address book and all of your friends on Facebook and Twitter to help me spread the word on organics.